Spanish producer Psyk (a.k.a. Maan or Manuel Anos) is an audio technician who makes good on his name; each of his new releases acting like a steely sonic probe to be launched into the as-of-yet uncharted depths of the psyche. His newest release for the Mote-Evolver label (following last year's Time Foundation album and the EPs Aracade and Distane) is solid and elemental techno as ever: it fits neatly into the label's stylistic template of mesmerizing precision yet never forsakes individuality in order to do so. Like Psyk's other offerings for this label, the new EP works its magic on the central nervous system with a perfectly interwoven blend of up-front anxious sequences and mysterious luminous undercurrents, making for an experience whose energizing effect lasts well after the record has stopped spinning. Where records like Distane rolled over dancefloors with a metallic, cardiac thump, "Human E.P." spins its enveloping cocoon of sound around the listener in a less aggressive - but still enjoyably intense - manner. With its crystalline mesh of bass kick, jittering hats and persistent 8th-note percolations, the opener "Human" immediately lays a foundation which will command listeners' focus, but soon enough a whole new substrata of strange, beckoning noises can be heard beneath this impermeable layer of technoid sound. This 'more than meets the ear' strategy is the key to this new release's infectiousness, and it's once again employed to strong effect on the b-side's "Powder" (which adds driving ride cymbal and a cleverly subtle filtering to the mix.) An additional b-side, "Aumento," features a gorgeous interplay between a high whistling oscillator and its lower pitched counterpart, bringing on the trance state so strongly that you can almost see pulsing concentric circles and whirling form constants as you shut your eyes. For purchasers of the digital EP, a bonus mix of "Side Human" provides an encore performance of the lead-off track with an additional helping of deft filtering, insistent handclap and percussive depth. Psyk's basic mission - to map out and expand consciousness with dense corporeal music - is an exciting one to be a part of, as well as a necessary and timely one. 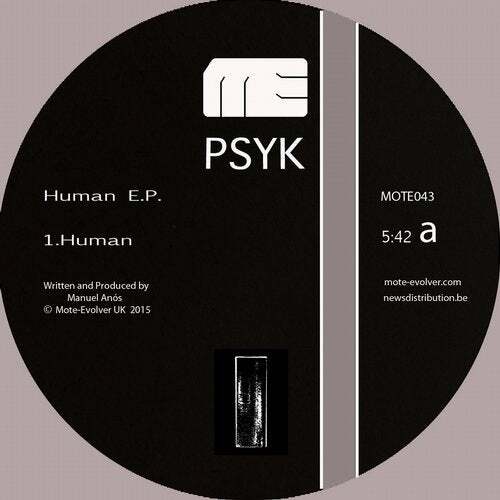 In a teeming electronic music galaxy where many producers still mistake a bag of sonic tricks for a wealth of insight and sophistication, Psyk and Mote-Evolver just shrug their shoulders and continue to show what genuine growth and progress sound like.